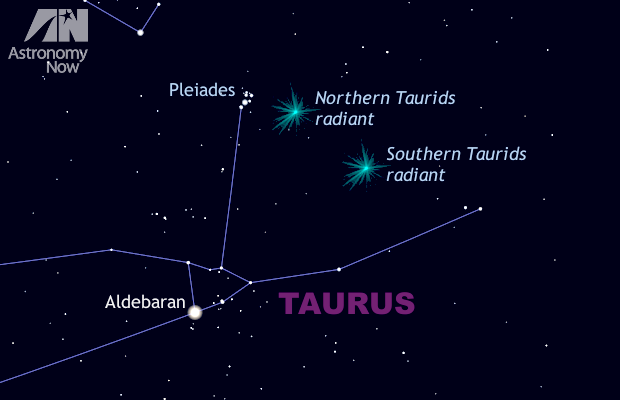 The Taurid meteor shower lasts from 20 October to the end of November, but has two distinct peaks of activity occuring on 5 November (the Southern Taurids) and on 12 November (the Northern Taurids). The radiant is the point where the shooting stars appear to originate. In 2015, the Earth is encountering a swarm of larger debris emanating from Comet 2P/Encke. The last time this happened was in 2005, when a larger proportion of fireballs were seen. Reports from around the world indicate that the same is happening this year. This view is about 40 degrees wide (or twice the span of an outstretched hand at arm’s length) and shows the eastern sky at around 9pm local time in the UK. AN graphic by Ade Ashford/Stellarium. The terrestrial fireworks of recent Bonfire Night(s) celebrations in the UK have masked a rather unusual display of natural illuminations, as we are in the midst of the Taurid meteor showers. However, this year’s display of celestial fireworks not only coincides with a new Moon for favourably dark skies, but the double-peaked shower is currently showing signs of unusually high activity similar to the fireball-rich display of 2005. The Taurid meteors, so named since they appear to come from the constellation Taurus, originate from the debris stream of Comet 2P/Encke which the Earth encounters between 20 October and 30 November each year. The shower displays two distinct peaks — the Southern Taurids on 5 November and the Northern Taurids on 12 November. In this interval one may expect about half a dozen slow, but often bright meteors per hour (particularly bright shooting stars are called fireballs) as seen from a dark location free of light pollution. The exciting aspect of the Taurids is that the debris from Comet 2P/Encke is larger than typical meteoroids which are about the size of a grain of sand. 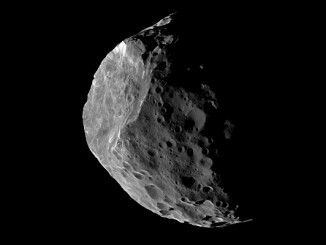 A pebble-sized Taurid entering the Earth’s atmosphere at 62,000 miles (100,000 kilometres) per hour — that’s 17 miles per second — is going to burn up due to friction with the air in a fraction of a second producing a fireball potentially rivalling planet Venus in brightness. Meteor expert David Asher of the Armagh Observatory in Northern Ireland calculated that this year the Earth would pass through the same stream of large meteoroids that produced the excellent displays of 2005. Given the reports from around the world in recent days, it looks like he was right. And if Asher’s predictions hold true, we should still see further bright Taurids Monday and Tuesday night. The best time to look is around midnight, when the shower’s Southern and Northern radiants are high in the east. For meteor viewing you need nothing more than your unaided eyes to enjoy the show, so wrap up extra warm (a hat is important too), find somewhere particularly dark yet secure, set up a garden lounger or deckchair facing east with a flask of your favourite hot beverage beside you and enjoy the show! 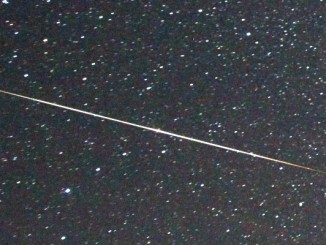 And if you’re clouded out now, there’s the Leonid meteor shower to look forward to mid-month. 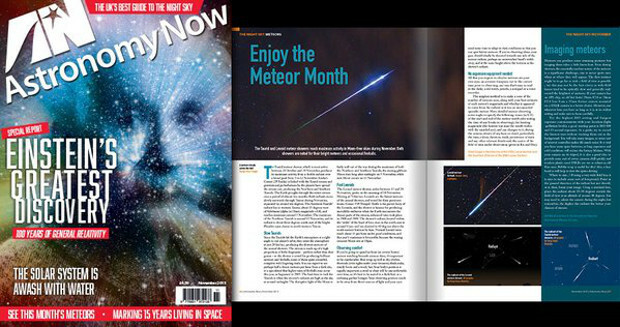 You can find out more about this month’s meteor showers and how to observe them in the November edition of Astronomy Now in addition to a full guide to the night sky. 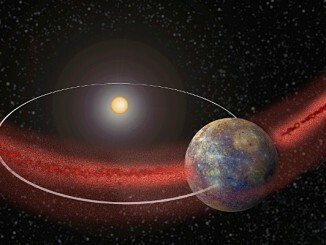 The planet Mercury is being pelted regularly by bits of dust from an ancient comet, a new study has concluded. Comet Encke has the shortest period of any comet, returning to perihelion every 3.3 years. The dust from the comet affects Mercury’s tenuous atmosphere and may lead to a new understanding on how these airless bodies maintain their ethereal envelopes. Over the last two decades, the discovery of hundreds of giant comets, termed Centaurs, on unstable orbits in the outer planetary system means that these objects pose a much greater hazard to life than asteroids, according to a team of UK astronomers. Centaurs are typically 50 to 100 kilometres across, or larger, and a single such body contains more mass than the entire population of Earth-crossing asteroids found to date.